SensGirl11 wrote: So do I, but Sutton wasn't great in Game 1 - and aside from that hit in Game 2, he wasn't amazing. He needs to get back to 'nasty'. I'm sure now he will, he looked so intense against that tool reporter. on a great team he's a 5th D-man. i don't expect him to be one of our top guy but re-sign for 2 mill x 2. i think he's aware of the upsides of his game. he also looks hungry to win. attitude that is greatly needed in all dressing rooms. I'm not quite sure how you quantify 'amazing' for a defensive defenseman. PKC wrote: I hope Sutton lines up Crosby and Malkin next game too. one pens per game... then they'll start bitting their nails. 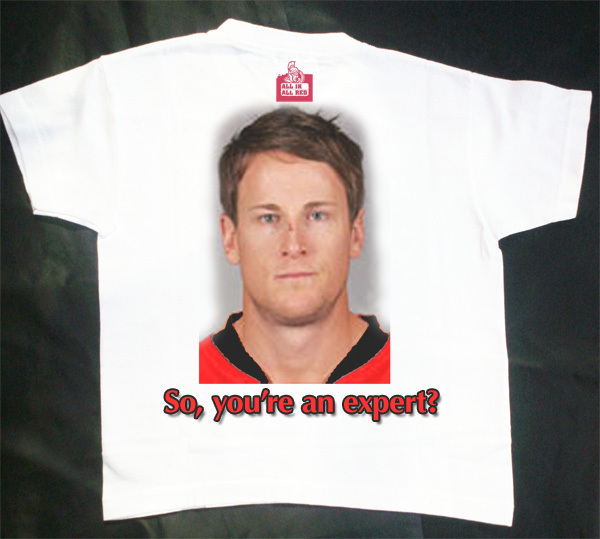 I'd laugh my Donkey off if the Sens started giving out Andy Sutton "Are You An Expert" Shirts. Or fans showed up wearing them, or with signs or banners. Dash wrote: I'd laugh my Donkey off if the Sens started giving out Andy Sutton "Are You An Expert" Shirts. Or fans showed up wearing them, or with signs or banners. I think you have your next assignment. You could probably make up a few hundred of these and sell out just standing outside SBP Sunday night (or Sunday afternoon, assuming the Red Zone is up again). Of course you wouldn't make much money. Especially if Gary steps in about licensing fees and such. Haha, be like George Costanza. "I'm a bootlegger baby". I would likely get sued, though I could just sell shirts without any logos and just the slogan, but I'd also have to do this all by tomorrow when I am stuck here in Bramladesh. I am going to try and get a sign made for tomorrow night. Keep an eye out for me. ElliottRules wrote: I am going to try and get a sign made for tomorrow night. Keep an eye out for me. What section will you be in? Big Ev wrote: I thought Sutton's hit should have warranted a charging minor if anything, but it was a sick hit! Penguins defenseman Brooks Orpik thought 'it seemed like a pretty good hit to me, to be honest. You never want to see anybody get hurt, but that was someone, from watching video, he likes to step up like that in the neutral zone. If anything, maybe Leopold was in a vulnerable position, leaning forward. 253 Re: GAME 2 - 2010 Stanley Cup GAME DAY: Ottawa Senators @ Pittsburgh Penguins, Friday Apr. 16, 2010 - 7:00PM EST.